I consider myself a seasoned adventurer when it comes to food, but a trip to a Korean sushi restaurant (해물집 or "hae mul jeep") is always humbling. When a Korean recommends sushi (or sashimi*) for dinner, be prepared. It won't be your typical L.A. california rolls! Growing up in the 1980's, I remember when sushi was "yuppie" food for those rich financiers in Manhattan. These days, you can find sushi restaurants in just about any small town in the U.S. Upon my first daring bite of raw fish, I remember being pleasantly surprised at the tender softness of the white tuna that melted like butter in my mouth. Fast forward a few years to a trip in Korea, at an opulent sushi restaurant in Jeju Island. As the server laid our selections across the large table, I saw nothing that resembled the tender meaty slices of red and white tuna I was accustomed to eating...and some items were moving! I later learned that Koreans have much pride in their style of sushi/sashimi, which is distinctly different from the way Japan prepares and serves its raw fish selections. In Japan, the fish slices are first frozen and then thawed before serving; the art is in the thawing process to achieve a soft tenderness. Korean sashimi, on the other hand, is all about the freshness. It is common to select your fish - live - from a tank as you enter the restaurant. It is then sliced, plated, and presented within ten minutes. Korean sashimi is, therefore, a different experience. The fish selections are usually more local and regional. The texture is firm and the cuts thinner, but longer. A common way of eating sashimi is to wrap it in a perilla leaf or lettuce, adding a shave of garlic and some red pepper paste (고추장 or "gotchujang"). 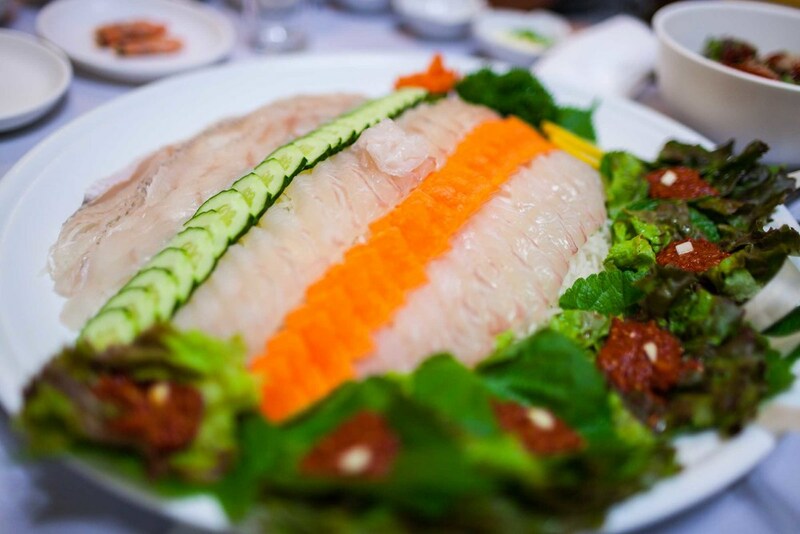 The other aspect of a Korean sushi experience is the variety of seafood. 해물 actually means "seafood", not fish. So, there could be a wide choice of options, from sea cucumber to squid to writhing, squirming octopus slathered in gotchujang (called 생낚지 or "saeng nakkji" - live octopus). I have yet to summon the courage to try 생낚지, but my step-son enjoys showing me how the suckers stick to his tongue. Hmmmm. * Sushi in Korea is raw fish laid on top of a lump of rice. Sashimi is just the raw fish slice.